This is a Standard Round Three Function Incandescent Trailer Light for the right hand/passenger side. 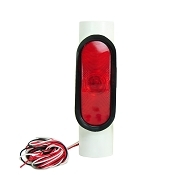 This light is a perfect replacement for your Utility style (non submersible) trailer. It performs the basic three functions of stop,turn, and tail. It Uses a standard dual filament included 1157 bulb which can be replaced by removing the lens. It mounts using two integrated mounting 1/4 inch bolts and included hardware that has the standard 2 inch spacing found on most light brackets. One of the posts acts as the ground when mounted to the frame of your trailer. The pigtail coming out of the light is wired Red for your brake and turn signal and Brown for your tail/running lights. For the matching Left/Drivers side light which includes the tag light we have:Round Standard Three Function Incandescent Trailer Light LH. This Light will commonly mount inside a Round Light Protector for protection from damage. This Light is 3 3/4 inch Outer Diameter and is the industry standard 428S distinction. Direct replacement for my mid 2000s triple crown trailer. Plenty of extra wire to cut or tuck away if needed and housing seems sturdy enough. Nice and bright out of the package. Led bulb not needed imo. Side Marker Trailer Light Amber Submersible Single Stud 2 1/8"